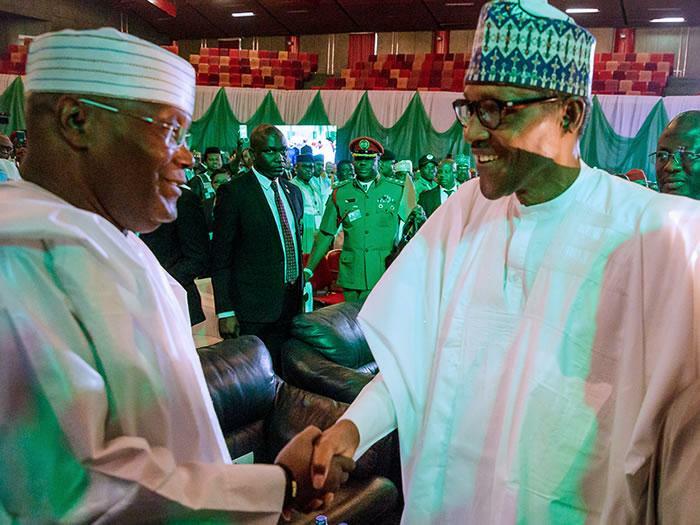 President Muhammadu Buhari and former Vice-President Atiku Abubakar, on Wednesday, pledged their commitment to violence-free elections and called on the Independent National Electoral Commission to ensure free, fair and credible polls. Buhari, who is the candidate of the All Progressives Congress and Atiku, who is the candidate of the Peoples Democratic Party for Saturday’s presidential poll, made the pledge at the signing of the National Peace Accord at the International Conference Centre in Abuja. According to the President, the 2019 elections present Nigeria the opportunity to show the world it has matured politically after conducting one of the most peaceful elections in 2015. The President praised the Chairman of the National Peace Committee, Gen Abdulsalami Abubakar, and his members for their contribution towards peaceful elections in the country. Buhari added, “I am making a special appeal to our young people. Do not allow yourselves to be used to cause violence. Atiku echoed former President Goodluck Jonathan’s comment ahead of the 2015 presidential election that “my second-term ambition is not worth the blood of any Nigerian”, saying he was against violence. He said, “My ambition is not worth the blood of any Nigerian. “I appeal once again to INEC and the police to be fair arbiters in the upcoming elections, while letting neutrality prevail. Among the personalities at the event were former Liberian President Ellen Johnson-Sirleaf, former Tanzania President Jakaya Kikwete, former Botswana President Festus Moghai and the Secretary-General of the Commonwealth, Patricia Scotland.